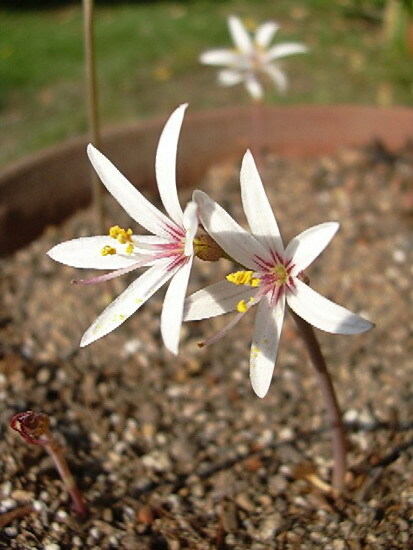 Traubia is a very rare Chilean member of the Amaryllidaceae family from coastal zones of the central provinces of the country. It is in serious danger of extinction. Flower stems no longer than 15 cm tall. Leaves linear, hysteranthous, scape hollow, spathe bracts 2 free rarely fused on one side. Flowers 1-5; perigone slightly zygomorphic. Seeds flattened, round, with membranous edges, testa black. 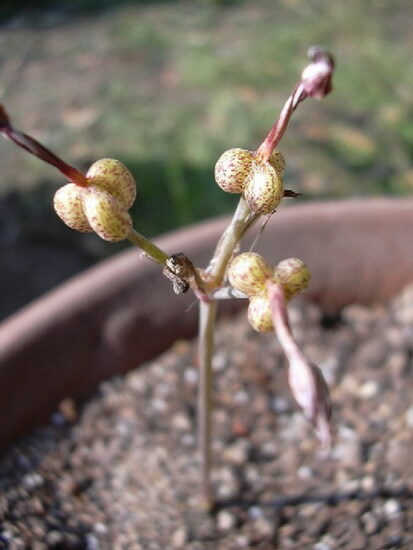 The seed pods have distinctive maroon spots. Traubia modesta Photo by Osmani Baullosa who writes: "I obtained some bulbs from the border of a highway construction. They produced 1-2 bulblets each and flowered in a same year."